Oceans cover over 70% of the surface of the earth, yet many details of their workings are not fully understood. To better understand and forecast the state of the ocean, we rely on numerical ocean models. Ocean models combine observations and physics to predict the ocean temperature, salinity, and currents at any time and any place across the ocean basins. This module will discuss what goes into numerical ocean models, including model physics, coordinate systems, parameterization, initialization, and boundary conditions. If I could recieve the answers to the questions I got incorrect after taking the pre-assessment or quiz, it would help me learn the correct answers in a timely manor instead of reverting back thorough modules over and over again. Real world examples of forecast vs. observations and analysis of success and/or failure of the model. A not too lengthy but at the same time very informative lesson. Enjoyed the pictures and graphics given with each topic. 1. 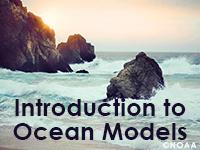 Explain the similarities and differences between ocean and atmospheric modeling. 2. Explain the physical laws and processes that must be considered in developing an ocean model. 3. Explain how the physical properties of the ocean differ from those of the atmosphere. 4. Explain the processes that are built into a numerical ocean model. 5. Explain how resolution and scale are important to global, regional, and local ocean models. 6. Describe a numerical model and how it can be used as a prediction tool. 7. Explain how real-time observations and climatology contribute to ocean models. July 2014: The fundamental science concepts in this lesson are still valid. The models are dated, but the concepts are solid.